Summary: Jefferson Davis Bussey (Jeff) is a sixteen year old living in Kansas in 1861 when the Civil War begins. After his family farm is attacked by Bushwhackers from Missouri, Jeff goes and enlists in the Union Army. In doing so he imagines glory and doing his part to defend the Union against the rebel leader in what was known as Indian Territory, the Cherokee Stand Watie. But soon, as is usual in any army, those visons are dashed by harsh discipline, bad food, and the exhaustion that comes from marching for miles without break. Jeff has a particularly difficult time with one officer as he will not change his name (he was named for the President of the Confederacy whom Jeff’s father had served under during the Mexican War). Once gaining the ire of this officer, it seems he goes out of his way to make life hard for Jeff. Jeff soon is in battle watching friends die and knowing fear and then being sent to forage for provisions from those in the territory the Union holds, many of whom are supporters of Watie and his army. It is there that Jeff meets and falls for a young woman who sees him as an invader and nothing more. Soon Jeff is sent on a mission behind enemy lines to discover how the rebels are being supplied with rifles that are clearly being stolen and sold to the enemy. In doing so, Jeff is pulled deeper into the lives of the army led by Watie. There he discovers that they are men just like him, with many of the same hopes, dreams, and fears. Jeff is clearly in conflict as he realizes that he must make a choice: will he honor the oath he took to the Union or will he abandon it and throw his pledge with the men he has come to know and respect? Literary elements at work in the story: This is clearly historical fiction and is told from the standpoint of Jeff Bussey, a teenager with big ideas, ideals, and experiences. The characters, aside from Stand Watie and others, are not real but are representations of many who fought, lived and died during the war on both sides. The style of writing is very realistic. One can sense the fear and trepidation during the battles scenes. The characters are likable but also real. They are truly humans who make mistakes, say the wrong things, and feel for each other. Perspective on gender/race/culture/economics/ability make a difference to the story? At the beginning, Jeff is convinced that all those on the rebel side are just like the Bushwhackers, violent and just wanting to destroy. He believes that they have no standing for the fight that they are carrying on at the time. As he gets to know those in Watie’s army, he begins to understand that the Cherokee and other Indian Nations have long standing grievances with the United States. He sees that they view themselves as a separate nation and fighting to defend that by joining with the Confederacy. His understanding helps readers to see that sometimes the lines between the sides during the Civil War were not black and white, but quite gray. Theological Conversation Partners: The most obvious connections I saw with this was the call to not judge and to be reconciled with one another. Jeff saw those on the other side as bad people before he got to know them. Just as Jesus calls us to not judge by what we see, Jeff, and others including the young woman whom he is sweet on, have to learn this the hard way by living with one another. The theme of reconciliation is full throughout the book but most clearly at the end where Jeff reaches out to many whom he opposed. Faith Talk Questions: 1. How does Jeff change from the beginning of the book? Which do you believe was the most eye opening incident for Jeff? Jeff takes a crucial stand at one point. Would you be able to do the same and for the reasons he did? Why or why not? Have you ever thought something of a person and then get to know them and realize you were wrong? What happened? How does God want us to deal with those we think of as enemies? Is it easy? Jeff had to change his views of those who were the opposition. In what ways might the views of those in Watie’s army have changed toward those in the Union army, especially after knowing Jeff? 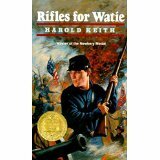 Rifles for Watie by Storypath is licensed under a Creative Commons Attribution-NonCommercial 4.0 International License.